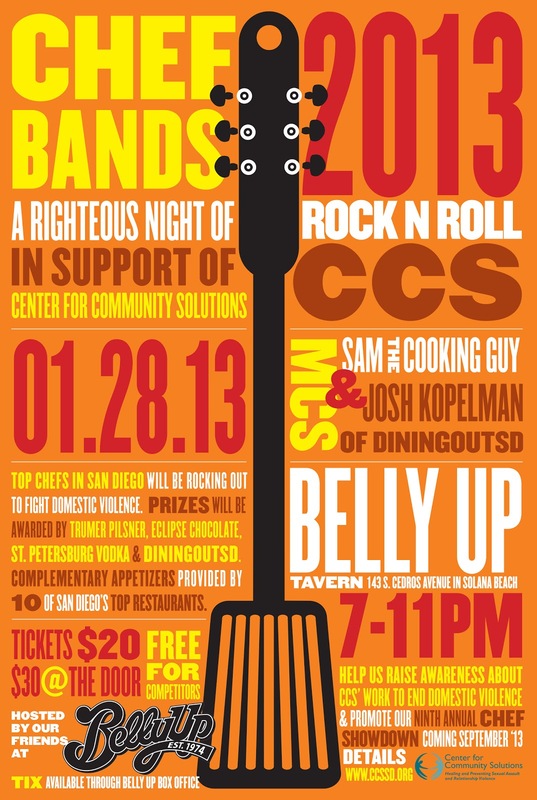 On January 28th, North County's beloved music venue Belly Up Tavern will be the setting as local San Diego chefs will toss aside spatulas and knives, substituting them for guitars and drum sticks in the 3rd annual Battle of the Chef Bands. 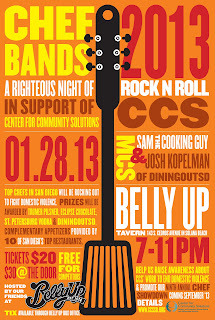 In support of the Center for Community Solutions, chefs will rock out with their bands, old and new alike, showcasing their musical, rather than culinary, abilities. The battle of the bands between chefs and restaurant teams provides local chefs, who already do so much for local charities, to boast another set of incredible skills while raising awareness of domestic violence and promoting this year's Chef Showdown - a long-running culinary competition and fundraiser. Chef rockstars will hail from Stone Brewery, Jaynes Gastropub, Cafe Chole, Venissimo Cheese, Richard Walker's, barleymash and others. And, as if the musically inclined chefs aren't enough to lure fun-lovers from around San Diego, tastings will be offered from local restaurants including Marina Kitchen, Sushi on a Roll, Nobu, Barrio Star, Wild Thyme Catering, Solace and the Moonlight Lounge, Sadie Rose Bakery, Casanova Fish Tacos, Eclipse Chocolate, and Hodad's. Emceed by the vibrant Sam "The Cooking Guy" Zien and DiningOut SD's charismatic publisher Josh Kopelman, the night is sure to entertain, and with proceeds benefiting the domestic violence awareness efforts of CCS, a real, feel-good event. "Chefs do so much work for charities around San Diego that I wanted to have a fun event where they could just have fun....and rock out. Chefs are not only talented artists in the kitchen but many love to play music," graciously exclaims Kopelman, who has worked long and hard to perfect this benevolent event. Tickets are only $20 ($30 at the door). Doors will open and the event will begin at 7:00 PM. Attendees must be 21 years of age to attend. Belly Up Tavern is located at 143 S. Cedros Avenue in Solana Beach. For more information or to purchase tickets, visit Belly Up online.